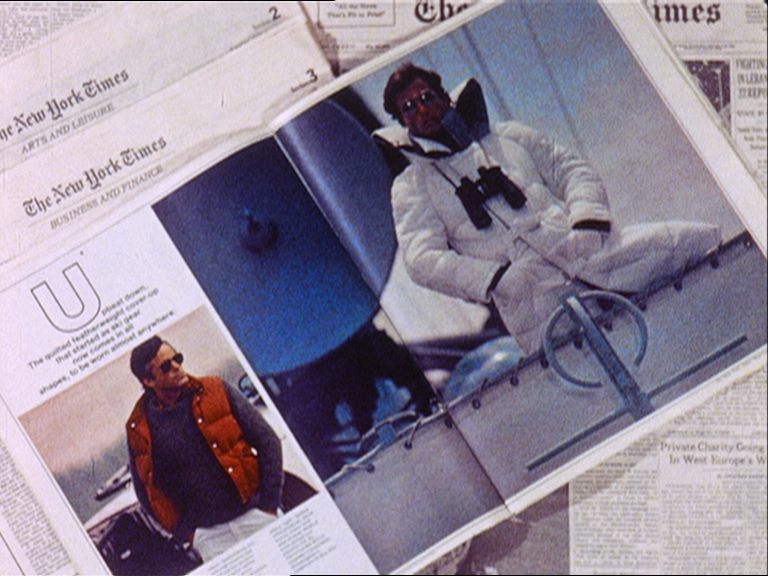 Argument has been described by its makers as “a film of intervention.” Partially inspired by Godard and Gorin’s Letter to Jane, it is an essay film built around images of men’s fashion ads from an issue of the New York Times Magazine, with text and narration that offer a variety of critiques of the independent filmmaking of its time. Most centrally, it raises the question of how an effective form of political cinema could emerge at a moment when filmmakers were divided between two seemingly incommensurate tendencies: on one hand, the desire to promote the views of the left to as wide an audience as possible through the vehicle of mass-produced, Hollywood-style narratives; and on the other, the avant-gardist insistence that a truly radical practice must reject conventional form in favor of a deeper investigation of both perception and representation. To this end, early screenings of Argument in London and New York were held workshop-style, with select groups of audience members chosen from the local communities of filmmakers and artists. Every attendee was given a 25-page publication prior to the event, with notes on McCall and Tyndall’s own working statements for the film; the screenings were each followed by a discussion among the members of the audience and the filmmakers. Tonight’s screening will be followed by a discussion with McCall and Tyndall about Argument. A limited number of copies of LUX’s reprint of the original Argument publication will be available at the event.